When people ask me what my favorite type of craft project is, it’s always a little hard to answer because it doesn’t fit neatly into one category. Basically, I love anything that involves using my Silhouette die-cut machine. I wrote last week about how I had been decorating my daughter’s school supplies with adhesive vinyl. I thought I would show a few other similar projects I’ve done lately. 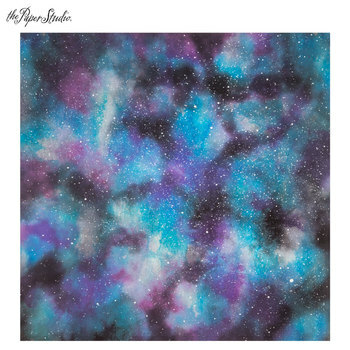 In the last few months, I noticed that the vinyl companies have been releasing some amazing patterns of adhesive vinyl. It took me a while to think of how I might want to use patterned vinyl. About the time I posted a photo of those pencil boxes, my friend, Chrissy, posted some photos of how she had decorated her laptop with the same holographic vinyl. I was inspired to give my laptop a facelift! Hobby Lobby now sells individual 12×12 sheets of adhesive vinyl, which is the perfect low-investment if you aren’t quite sure what you are doing! 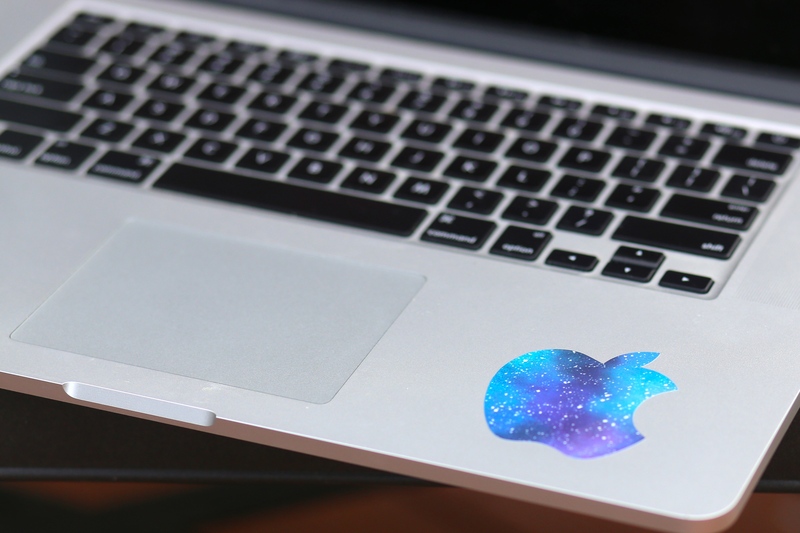 I thought this pattern called Cosmic Sky would look great against my silver laptop. 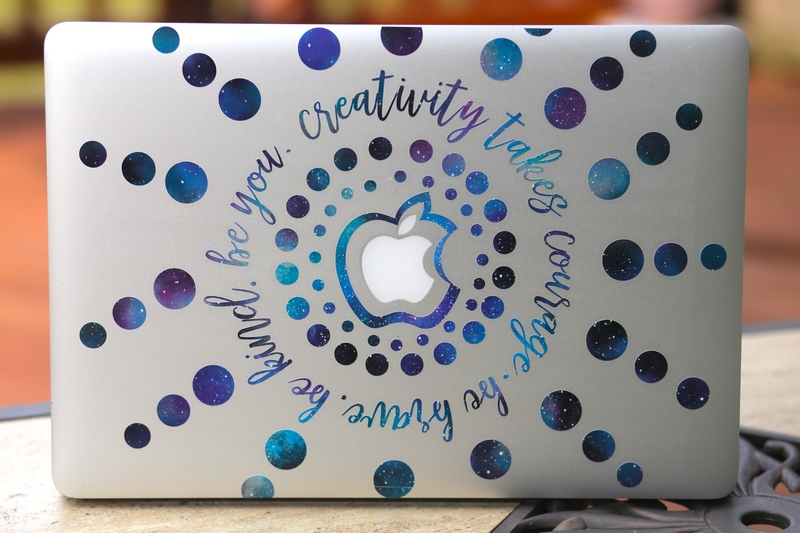 Along with my love of the night sky, I combined my obsession with manadalas and a brush stroke font to create some computer bling. I started by grabbing a jpeg of the Apple logo since I knew my pattern would start there. I just increased the size of the logo so it would be an outline of the apple on my laptop. From there, I started drawing circles in my Silhouette software. I think I love the mandala design because it’s so easy to create, even if you are like me and you aren’t a great artist. I knew I wanted some words in the design, and I was super happy when two of my favorite phrases fit perfectly. “Creativity takes courage.” And “Be brave. Be kind. Be you.” (These are just phrases I made up.) 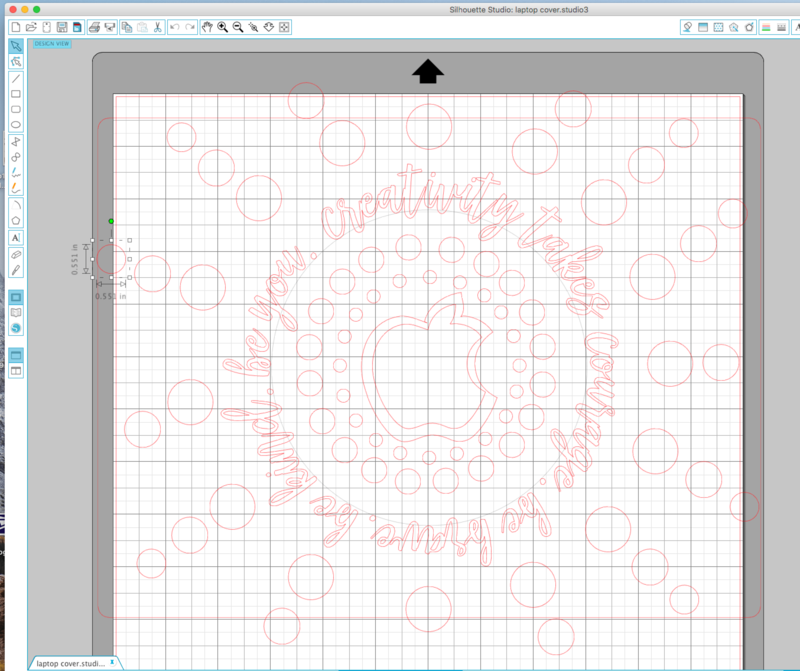 Thankfully, the Silhouette design software allows you to write in a circle! I cut out the entire design on one piece of vinyl. Then I weeded out the part I didn’t need, added transfer tape, and carefully adhered it to the top of my laptop. I ended up with the original Apple logo design in my scraps and decided to put it on the inside of my laptop. I’ve also been using my Silhouette lately to make personalized water bottles for gifts. I love having ideas for cute little gifts sets that I can give to friends, family or teachers. I used the most highly adhesive vinyl for the water bottles. I know it won’t stick forever, but hopefully, it will last a little while. 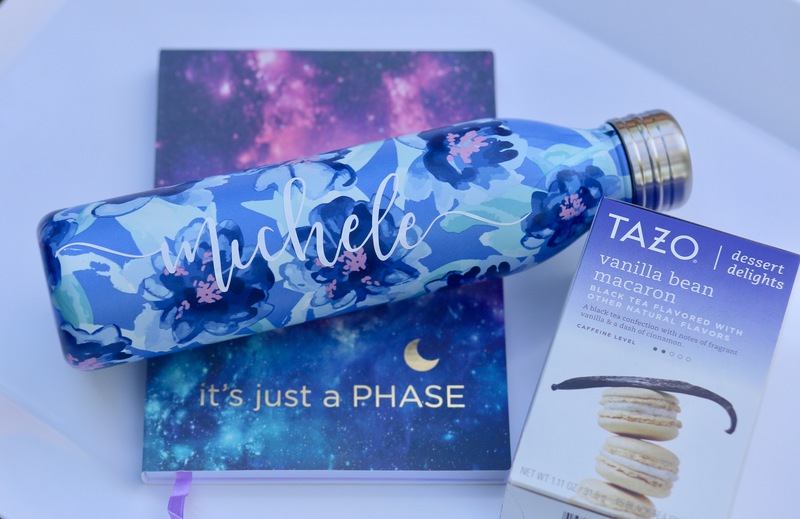 Who doesn’t love a water bottle, some unique tea and a little journal in cute colors? 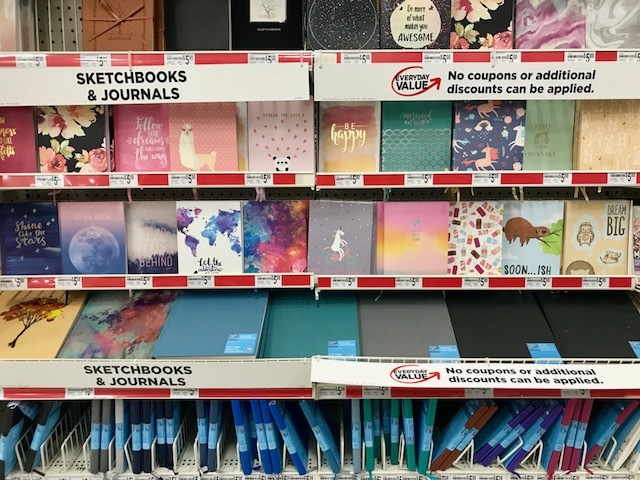 Michael’s has a ton of these journals in so many adorable patterns. I can’t wait to make a few more of these little gift sets when the need arises! What are your thoughts? Tell me about your craft obsessions. Any other Silhouette users out there? Love it! 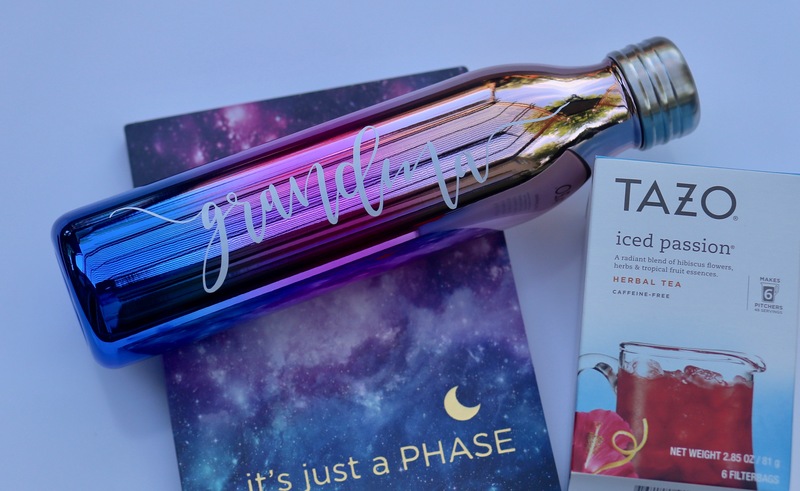 What is the font you used on the water bottles? Hi Cassie! The font I used on the water bottles is called Masterblush. It’s one of my favorites!